Now that the pond tour is over, I decided to finally remove the invasive Oriental bittersweet (Celastrus orbiculatus) that I mistakenly planted a couple of years ago. 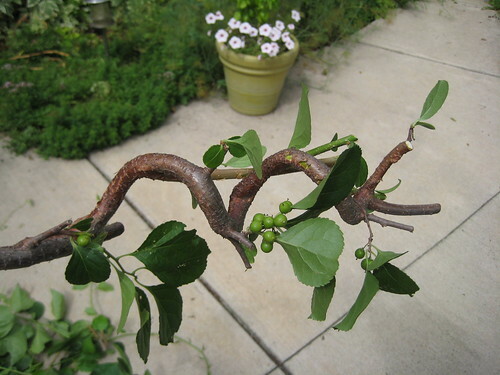 I was planning to do it at some point, but Beth Botts’ post about invasive species recently banned in Chicago – including C. orbiculatus – got me moving. Well, that and all the bittersweet fruits that were forming! I have tried to prune the C. orbiculatus (the bushy stuff on the left half of each of the two trellis panels) back a couple of times this year, but this only seemed to provoke greater growth. 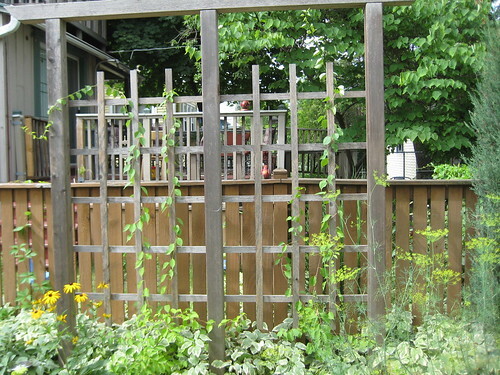 My native C. scandens (on the right half of each trellis panel) is growing really well, but is still sort of puny compared to the much older invasive. 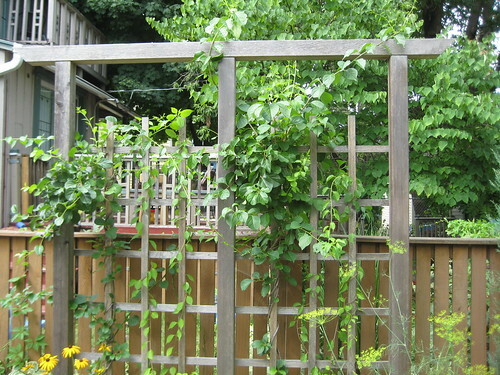 A good hour of work with pruners, loppers, and a shovel (for the top foot of roots) later, it’s all gone and C. scandens has sole possession of the trellis. (Pretty impressive growth for something I planted only a year ago!) Since the old stuff is an invasive species and very woody, I skipped my lazy compost pile and put everything in a bag for municipal composting. That should be hot enough to kill all those berries that the C. orbiculatus was growing. Lazy Urban Composting, Part 5: Not *That* Lazy! As demonstrated by the dearth of posts in the past year under lazy urban composting, all I’ve done in the past year is to toss stuff on the pile, including a lot of rotten vegetables. That…was not the best idea I’ve ever had. I finally dug it out, and there was precious little that had composted down enough to use. While I banned sticks from my compost pile a while ago, there were a lot of stems and potatoes and other relatively hard objects that survived a year in the pile without doing anything. So, this year, I’m going to try to chop up anything that’s not a leaf going into the pile. Cutting back on our CSA subscription should also help, since we really didn’t need it in the middle of summer and would tend to only eat the vegetables we picked out at the farmers market. And I need to turn it at least once a month, particularly since my definition of turning is “hack at it with a rake for 2 minutes”. Even a lazy gardener should be able to do that! I was going to post a picture of some early sprouts coming up, but there aren’t any. However, a stroll around the backyard revealed that there were other things that I could do: pull more leaves and twigs out of the pond (and pat myself on the back for the lack of string algae), pull out some dead annuals to toss on the compost heap, and prune off a dead branch from one of the Skyrocket junipers. Now, of course, I see lots more yard cleanup I could do: pruning the Annabelle hydrangeas (which are currently half-pruned by the ice and snow of winter), redistributing the pebbles in the pond so the liner doesn’t show, and so on. Since it’s going to be a cold weekend, though, I might just go to the flower show instead. Alas, no pictures today because it’s been cloudy and the days are so friggin’ short now! Fall is one of the busy times with the pond. Not only are there lots of trees in my yard, but there are lots of trees in all the surrounding yards, and the fallen leaves will blow around until they can’t blow around anymore. One good way to stop a leaf is for it to fall in the pond. So the skimmer has to be emptied at least once a day (more than that if it’s particularly windy or rainy), and I’ve also been using a skimmer net to pull leaves off the bottom of the pond. The water lettuce and water hyacinth – both tropicals – are now residing on the compost heap. I found last year that a bit of work in the fall and early winter can really reduce string algae in the spring. I need to also remember that while it may be necessary, it is not sufficient: an April cleanout and bacteria reseeding is also required! Lazy Urban Composting, Part 4 – Two Buckets! Some of the recipients of the compost pile output. I finally dug out the compost pile over the weekend, and got two buckets of the good stuff for the bed beside the garage. I probably could have gotten more if I had really dug the whole thing out, but it was too easy just to dig a hole in the side of the pile and pull out what I did get. The compostable plates I put in the pile at the beginning of the summer were completely gone, so I’ll definitely be buying more of those again. There are still too many sticks in the pile, which means I need to get a little more strict about what I put in there. Best of all, nearly all of our vegetable and fruit waste went into the pile instead of down the garbage disposal – more soil for the garden, and less water wasted. My conclusion is that you can compost without putting any effort into it outside of digging it out twice a year – it may be less efficient than having a well-maintained “hot” pile, but it still works! We’ve been having a little water in our basement after heavy rains, and we noticed that water from our neighbors’ downspout was pooling right outside our basement where we’re seeing the water. Sounds like a job for a rain garden! One of the neighbors and I dug out the outline of it last weekend and she dug a path from her downspout to it (our downspout already sends the water that direction). The grass went into the compost heap, and I keep hauling buckets of dirt off to fill low spots in the lawn and in the sideyard. 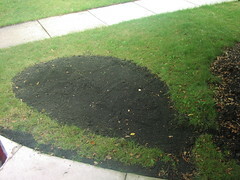 Once I take it down a couple of inches from the level of the lawn, I’m going to rototill in some (store-bought) compost and then cover it in mulch to make the bed look level. How soon this gets done depends on when the rain and humidity let up – it was dry until we dug this, and ever since it’s rained every day! Plants? Well, I’m hoping to pick up some sweet black-eyed Susan and New England aster at the farmer’s market this weekend. This fall, I want to plant Virginia bluebells and maybe Jack-in-the-pulpit. For late spring and early summer, maybe more of my favorite blue lobelia or cardinal flower along with some irises. I’m continuing to scour my native plant catalogs for part-shade, sometimes-wet, clay-loving plants, and finding a surprising number of options (although given that it is in the front yard, I should probably avoid some of my favorite ones with poisonous parts). 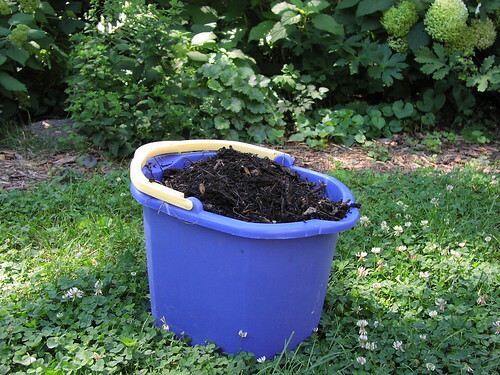 Lazy Urban Composting: Part 3 – Bucket o’ Compost! The compost pile hasn’t settled much in the past couple of weeks, so I decided to dig it out and see what was going on. The compostable plates are showing signs of breaking down, although perhaps regular paper plates would show the same behavior. Despite my decision to keep sticks out of the pile, there was still a fair amount of woody material in there, steadfastly refusing to break down. But hey, I still got an entire bucket of compost! This may not seem revolutionary, but previously I would dig out a shovelful or two in late fall or early spring and that would be it for the year. I’m certainly adding more stuff to it now that there’s a compost pail by the sink and we’re getting loads of veggies from our CSA, but I believe it’s breaking down faster as well. The compost went to the front of the sideyard, where there’s a lot of bare clay and a handful of plants trying to hang on. 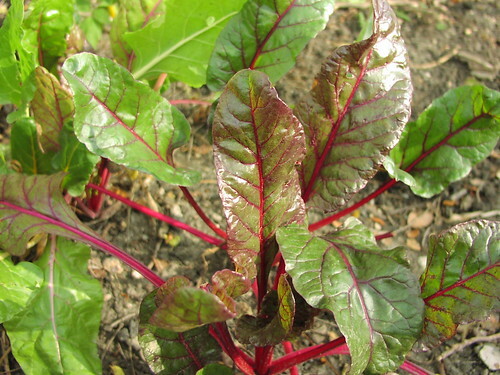 Improvements I’m considering are: watering it when I’m watering thevegetable/fruit bed next door to the pile, and maybe even aerating it every so often. I hate watering, though, and I don’t really have any proper aeration devices (a shovel? a rake?) so I don’t know if I’ll change my lazy ways. Hey, if I get two buckets of compost a year with very little effort, I’ll count this a success.